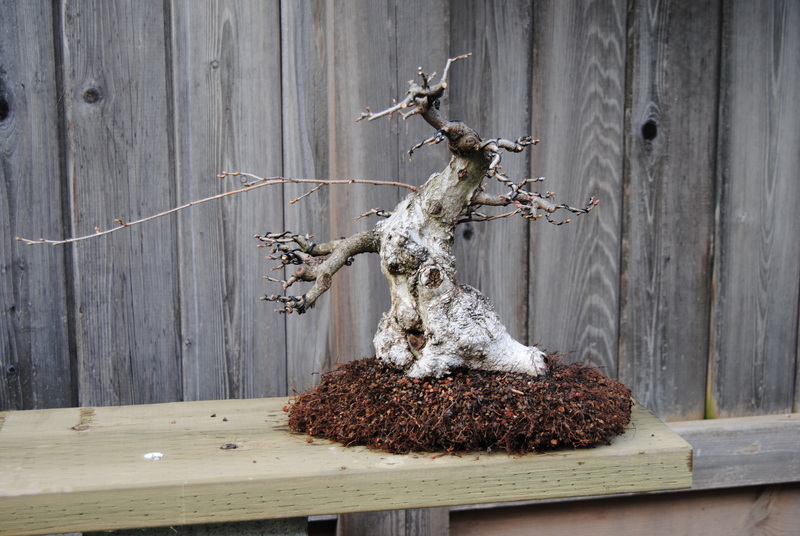 This hornbeam has been in a mica pot for 6 years while I have been building the branches and apex. It is still miles away but in the meantime it will be in a more attractive pot. 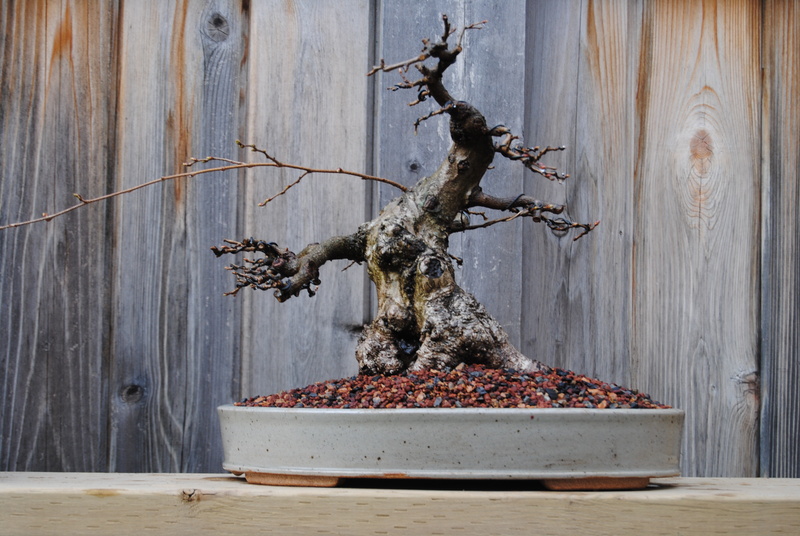 Like many bonsai enthusiasts, I am obsessed with old, collected trees. 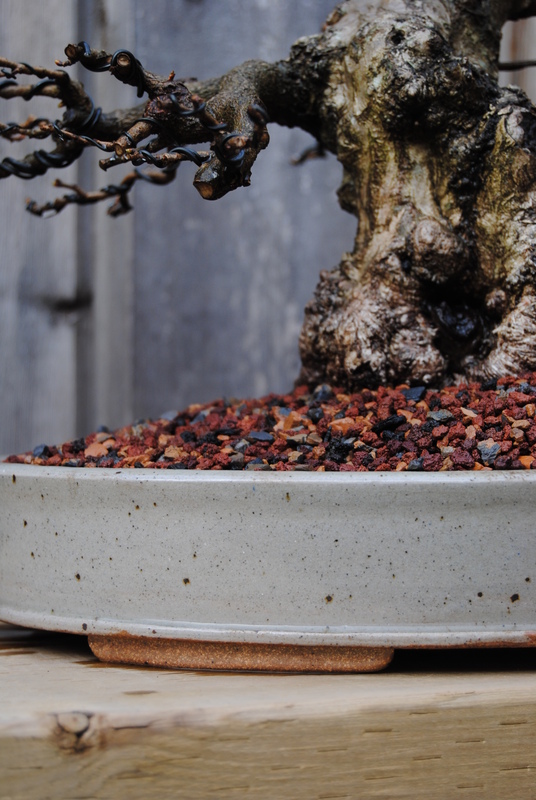 For several years I have been heavily biased towards collected material and still am today – nothing (well, almost nothing) excites me like a stunning piece of yamadori. Nevertheless, I find that wild material almost always lends itself to a dynamic, survivalist image. 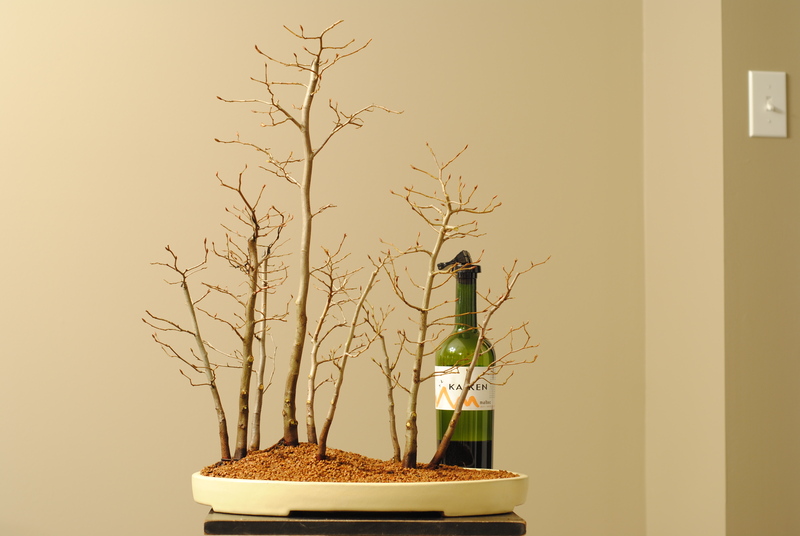 If I were to fill my yard with this material only, I would have a pretty monotonous bonsai collection. Already my collection is lacking in delicate deciduous trees (nine years of bonsai and I have never had a japanese maple!). 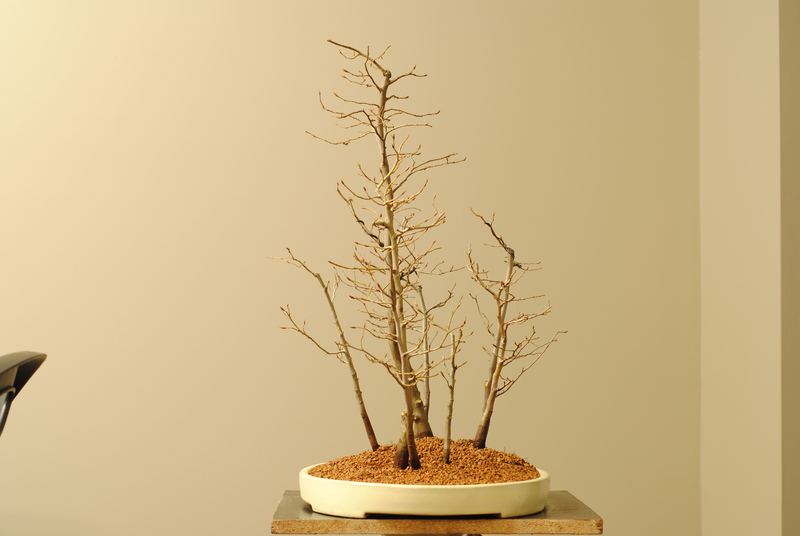 I was recently inspired by an article in Bonsai Focus #120 entitled Easy Does It, Forest Planting by Nobuyuki Hirose (see the preview of this issue here). 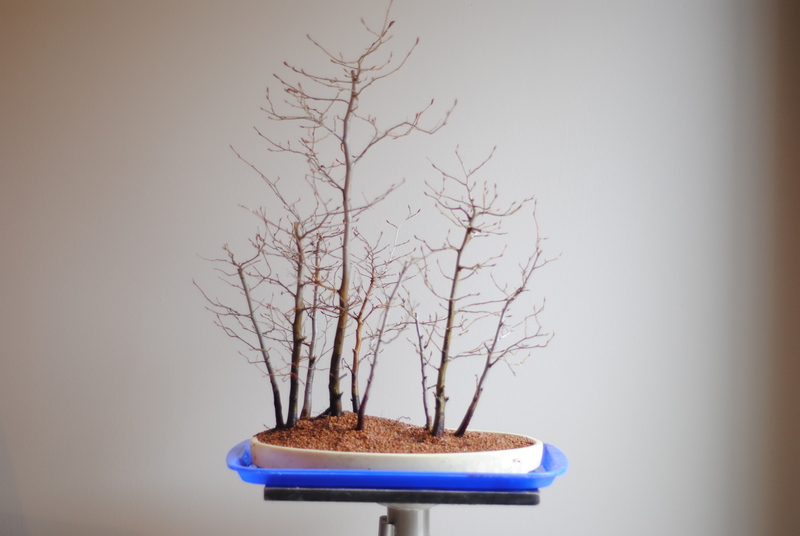 In this article Mr. Hirose and his apprentice use young beech and hornbeam seedlings to create simple yet elegant and attractive forest plantings. 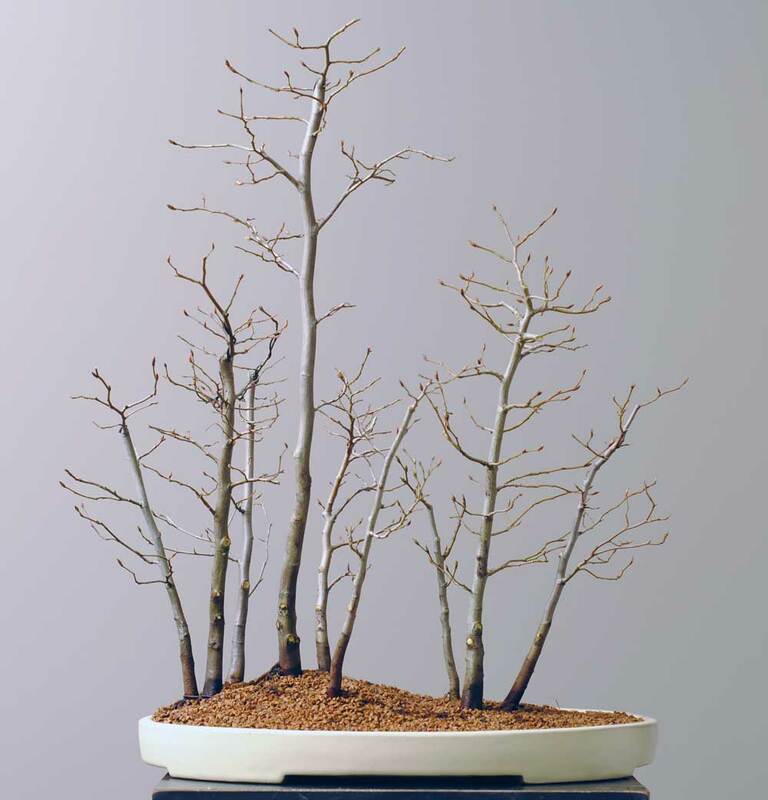 The careful selection of the material and design of the planting made these “sticks in a pot” into something special. Armed with these images in my mind, I visited my friend Andrew who works at a gigantic (read: millions of plants, literally) wholesale nursery and picked up a trunkload of American Hornbeam (Carpinus caroliniana), American Beech (Fagus grandifolia), and European Beech (Fagus sylvatica). 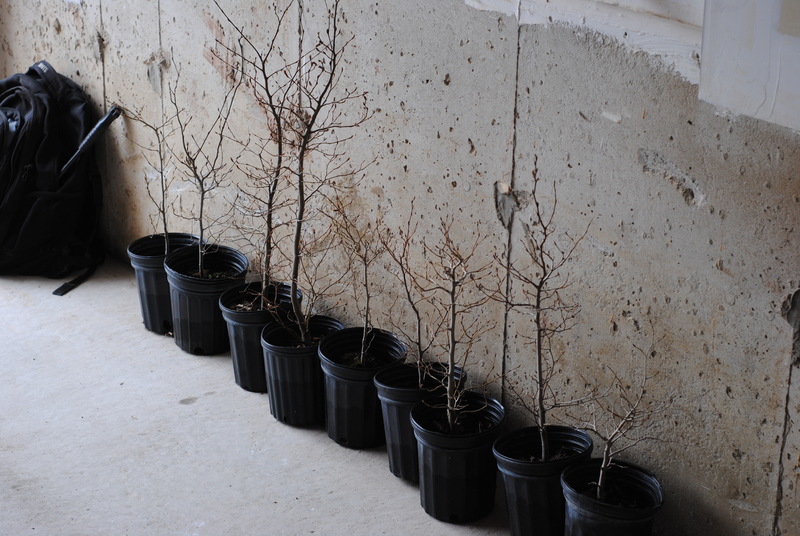 Today I made a nine tree forest planting of American Hornbeam. This species grows locally, although I have never found one worth collecting (most people who collect them trunk-chop them drastically, thus creating a long-term project). Like most hornbeams, these have fine twigs, smooth bark, and small buds – things which are useful for a small group planting that is best appreciated in winter. Hornbeams. These are all in one gallon pots, and roughly three years from seed. I tried to select a range of trunk sizes with gentle movement and lots of twiggy branching. 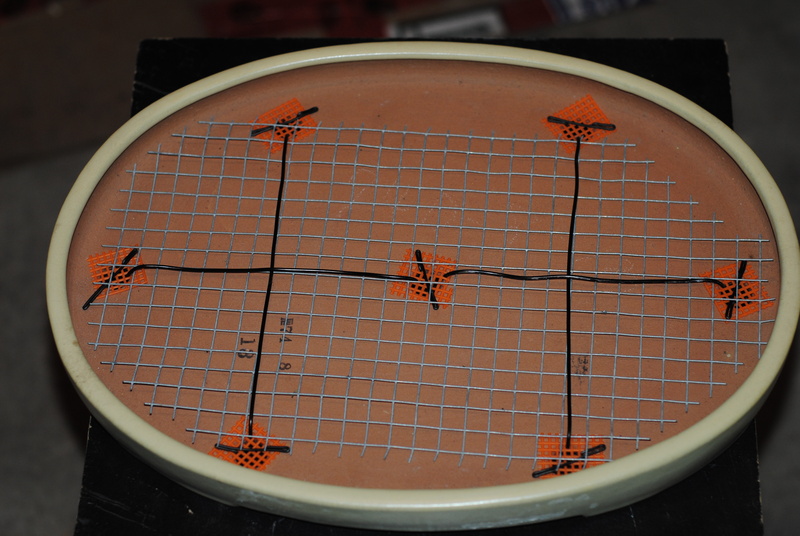 In addition to the normal screening, some 1/2″ galvanized steel mesh was tied down to the bottom of the pot. This creates as many tie down points as one could ask for, thus making it relatively easy to fine-tune the placement of the trunks. The cream coloured pot is by Yamafusa. I think a light blue pot would have been better, but this was what I had on hand. Every tree was more or less barerooted and at least 80% of the roots removed. 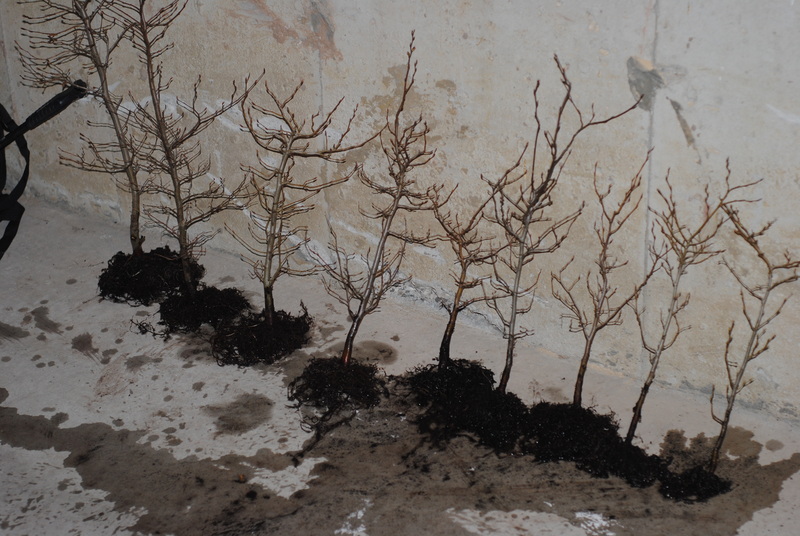 These trees were not prepared for bonsai, so each one had a massive taproot, roughly the same thickness of the trunk. Final image. I need to keep on top of the cutting this season to ensure that I don’t lose the delicate twigs. I would like to shorten the main tree by a few cm, but currently the necessary branches don’t exist.